19 | January | 2016 | Health Promotion Ideas: Let's Get Healthy! Promoting the benefits of social networking and healthy relationships. It’s the simple things in life that mean the most to us. Being able to talk to others is not just something that we like to do, but we need to do it. Socializing with others is part of our happiness. However, this doesn’t mean that all of us are social butterflies though. The need to socialize is different for each of us. Some of us like to have companions to walk together with, while others enjoy having conversations over dinner. Sometimes we are looking for families that we can interact with together with our family. Whatever the activity, building relationships is an important part of each of us. It is one way that we share our experience of the world with others. Our own needs for socialization drive the expectations that we have with our interactions with others. Those of us who are introverts will very likely choose settings quite different from those of us who are extroverts. 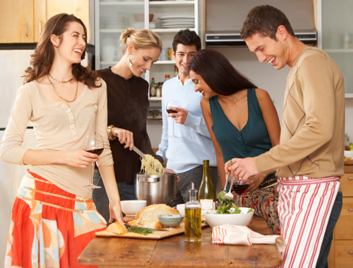 Social networking groups often use activities as the focus for people to find common interests. Whereas, other groups focus on facilitating people to meet each other, in order to provide opportunities for socializing with people in the area. One could also consider the differing networking opportunities offered to individuals, as compared to couples, families, groups, or communities, which allows for a variety of experiences & relationships to be formulated. We have many opportunities to enjoy the company of the people around us. The next time you think about socializing, ask yourself one of the following questions. Who would you like to social with or what activities would you like to do on your own, as a couple, as a family, as part of a neighborhood or community? Do you have people who you socialize with who you can relate with as an individual, as a spouse, as a parent, & as a neighbor? We all like to be around others who make us feel happy. What opportunities to meet others or to experience doing something should you consider next?